It’s Monday: Here’s a Smile For You! Hello Monday! 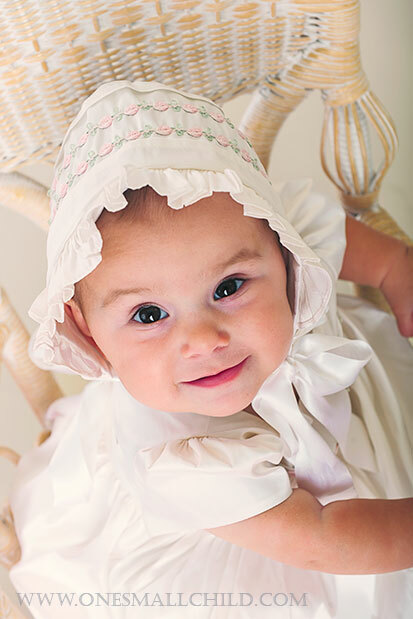 Here’s a little smile to brighten your day…Little Miss McKadie looks so pretty in our Jessa Christening gown! A baby’s christening or baptism is a special event for the whole family. As the day draws close, it is important for the family to choose the best boy christening outfit available. This is a special purchase that takes a lot of thought…after all, this is a rite of passage for both the baby boy and the family. 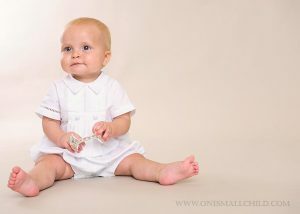 Enter One Small Child: it’s easy to shop for boy christening outfits options on the One Small Child website. With just a few clicks, parents, grandparents, godparents and friends can find everything they need for this big day. We offer a well-rounded selection of gowns, rompers and accessories to suit everyone. We know families want everything to go perfectly for this day, so we offer advice on how to measure infant boys to correctly select the size of a gown or romper. Anyone with questions can easily email or call us for tips on sizing or information on shipping. Checkout is easy: you can pay with major credit cards or use your PayPal account. Shipping is fast too–most orders are delivered within a week of placement. While you’re preparing for the big day, why not invest in some thoughtful christening gifts? Stuffed animals, crosses, personalized jewelry and traditional baby gifts are all offered on the One Small Child website. This is a chance to commemorate a truly special moment for years to come, and many of our items can be personalized with a cross or a name and date. After the event, many families want to save and preserve christening outfits so they can become family heirlooms. One Small Child offers a full line of textile-preservation supplies including muslin bags, keepsake boxes and acid-free tissue paper. Proper preparation makes it possible for families to pass christening outfits boy mementos down through generations. A christening or baptism only happens once in a baby’s lifetime. Thus, families want the best christening outfits boy options around. We’re here to help: shop with us before the big day!